We're back in catch-up mode again after the big Untappd badge update. Bit of a shame that I can't give all these beers the full reviews they deserve, but there is only so much time in the day... Oh well enjoy the review! Beavertown Neck Oil Session IPA earned me God Save the Queen (Level 22) and Pale as the Moon (Level 29). I really enjoyed this beer, the grapefruit bitterness was exceptional at the low ABV (only 4.3%). The can design is pretty cool as well. Holgate Little Heifer was the first beer I had after work a couple of weeks ago. For that reason I earned the Beer-Giving '14 badge and it was my 25th unique Hefeweizen which earned me Heffenista (Level 5). There was plenty of banana flavour, which was a nice surprise, but the body was a little too thin for my liking. An English Barley wine from Black Sheep Brewery notched up God Save the Queen (Level 23). It was a special brew for their 20th anniversary called Progress. Dad's cousin used to regularly visit Masham and absolutely raves about Black Sheep. I try and get all of their beers that make it out here - I'm very happy I bought this close to 2 years ago and have aged it, it turned out beautifully! It was a very smooth Barley wine with plenty of dark fruit flavours. 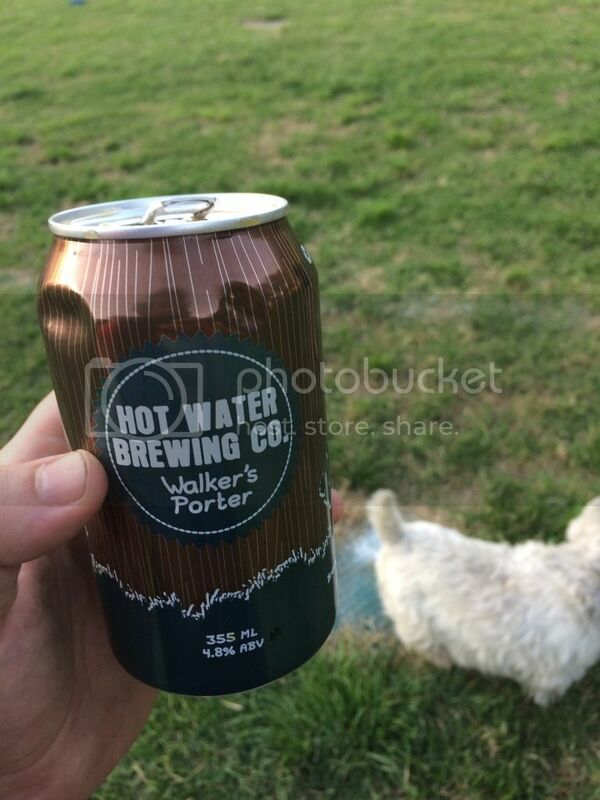 Somewhat fittingly I had a Hot Water Walker's Porter whilst walking Mum's dogs in the park while she was away. The badge? Heavyweight (Level 23). This New Zealand porter was an absolute beauty straight out of the can. It was almost the perfect park porter (alliteration much? ), with great roast characteristics but still quite a light body, without being too light. I don't think that makes a heap of sense, but trust me buy it! It's good. For this review that's a wrap guys! The two standout beers from this review are the Hot Water Walker's Porter and the Session IPA from Beavertown. Interestingly these were also two international can offerings... Speaking of which I better try and find a beer and do a bottle vs can debate review, I know a few of you are hanging out for another one.